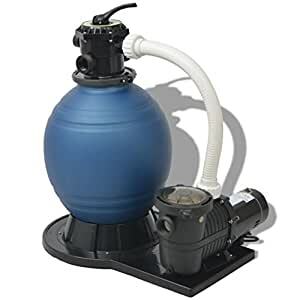 This sand filter system is designed to filter and purify the water of your pool using sand as a filter medium. This is a very economical and low-maintenance option to keep your pool water looking pristine. Made of high-quality and high-density polyethylene, the sand filter is durable. With a diameter of 18″, it has a flow rate of 4740 gallon per hour. The maximum working pressure is 50 PSI. The filter is equipped with a multiport valve with 6 positions: filter (for filtering the body of water), backwash (for cleaning the filter medium), rinse (for flushing the filter system), waste (for bypassing the filter bed to waste), recirculate (for bypassing the filter bed to the swimming pool/spa) and closed (for shutting off all water flow to the filter). The pump is suitable to be used for both in-ground and above-ground swimming pools, which means that the pump position can be above the waterline, while normal pumps must be placed lower than the waterline.For secure mounting, this set includes a base that can be fixed on the floor. To start running the system, 110 pounds of filter sand (not included) with a grain size of 0.018 to 0.022 inch are required. we shipping from United States, shipping time usually cost 3-8 business days.